To say we were blown away when we heard this one is probably an understatement. Since we switched to mp3 only, most m211 tunes use many of the advantages of that format, and this is a beautiful example (yehyeh, you can stop bitching now, MOD traditionalists!). 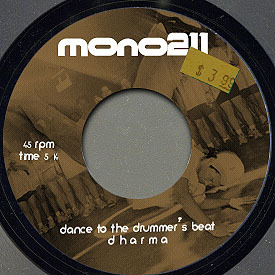 In any case, “Dance..” is an absolutely spectacular funkjam straight outta the Dharma+Prob. studiobunker in Helsinki. Dharma plays live bass and guitar on this one, and would also like to thank Panu Syrjänen for the wicked live tenor sax playing. On with the music, on with the show..? Also, a further plug – as you might have heard, Dharma and Prob. have a single out on the Audio Couture sublabel of Moving Shadow in just a few weeks – it’s called “Soulwarrior” and it’s by Dharma+Dice – we’ve heard the tracks and they’re the funkiest d+b you’ve EVER heard, and that’s official 🙂 So don’t forget to go buy the 12″ at your local record emporium.